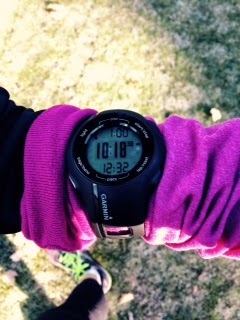 The Status of the Run Streak (aka, the Level of My Crazy) and Athleta Giveaway Winner! As I had predicted with the Run Streak, the biggest obstacles would be really bad weather and SICKNESS. (Well, I suppose there's a third obstacle which would be potential injury, but I don't want to jinx myself!) It's like clockwork, every November I get really, really sick. Last night I went to bed with a fever of 102.3 - yes, I'm counting the .3! And I just laid in bed not being able to sleep, feeling like death warmed over, more like on FIRE. By 3AM my fever still hadn't broken and I got up to take more medicine and laid back down until about 6AM when I finally turned into a clammy, sweaty mess and fell asleep. Lovely, eh? And what was I thinking the majority of this time? Oh, you guessed it. Will I be able to run tomorrow? Is this the end of my streak? I have officially turned into a crazy person. Thankfully it's the weekend and I was able to sleep until almost 10AM. After the hellish fever fugue, even feeling just mildly horrible with no fever when I woke up was kind of awesome. And, yep, I bundled up and went for what I thought was a very slow shuffle that ended up being a nice little 10ish minute mile. It wasn't too bad. I felt like I had spaghetti legs, but it was nice to get some fresh air and move a little! Now the other obstacle, snow and ice, that would prevent me from driving to the Y and also running outside safely. I suppose I'll cross that bridge when I come to it. I told my husband that I could probably just run circles around the living room for 15 minutes and call it good, right? Yeah. Crazy. Also! Thank you to all who entered the Athleta Gift Card giveaway, courtesy of fitmob. The winner is..... Elle! Elle, I'll be emailing you to get your mailing address and your gift card ASAP.